IEP (Individual Education Plan) is a term that seems to be getting increasing attention in the news across the country in recent years. If you have a child who has a mental health disorder or a learning disability, you are likely familiar with it already – and if you aren’t, you may want to learn more! The IEP is a system developed for public schools across the United States; it is designed to ensure that any child with a disability reaches educational goals. Each IEP is designed through IEP testing and planning between parents and the school to determine the best way to help each student individually. In essence, an IEP describes how a student learns and how they can best demonstrate that learning. The second part of that, of course, is describing how the school and teachers will modify lessons and/or provide learning resources to ensure the student is given the best access possible to learn the general curriculum. This may mean something as simple as allowing the student a quiet fidget toy to use while sitting at their desk, if the student struggles with ADHD, making accommodations to help alleviate test anxiety, or providing time with a speech or occupational therapist for a student with developmental disabilities. In order to create an IEP for a student, the first step is getting an evaluation for your child. Before an IEP can be put in place, the first step is determining whether the student has a learning disability and whether it is one that qualifies them for special education – which does not automatically mean separate classes. When talking about IEPs, special education refers to the overarching assistance the school is required to provide for anyone with a documented learning disability. 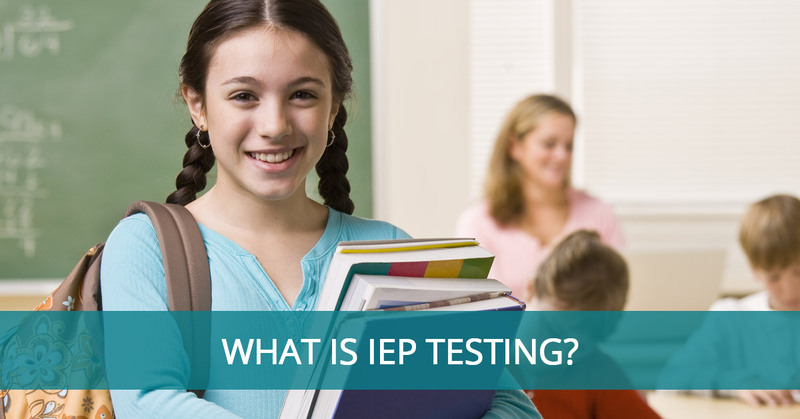 IEP testing is designed to test a child’s learning abilities and styles, test for learning disabilities that would have an adverse effect on their learning, and determine eligibility for an IEP. In addition, the IEP testing process can help determine the best ways to assist the child in school once he or she has been determined eligible. The IEP evaluation will assess everything from physical disabilities, like blindness or deafness, developmental delays, or intellectual and mental health impairments, which can include emotional and behavioral disorders, autism, and traumatic brain injury. This is not a comprehensive list, however, so if you believe your child is struggling too much in school and might benefit from an IEP, an IEP evaluation can help assess those questions. Unfortunately, the resources at many schools are often stretched too thin, so your child’s school may or may not be able to provide additional learning resources. An IEP is part of the measures put forth in the Individuals with Disabilities Education Improvement Act of 2004 (IDEA), which will ensure your child gets the help he or she needs. If you feel your child may need an IEP, come to Dr. Angela Reiter and Associates in Eastchester for an IEP evaluation and other learning resources to get your child the help needed!